The California Bar Examiners have released the fact patterns from the July 2018 exam (you can access them here). And we have started debriefing the July 2018 California Bar Exam essays and PT and preparing them for release. Q1 (UCC Contracts), Q2 (California Evidence), Q3 (P.R. ), Q4 (Community Property), Q5 (Constitutional Law), and PT are now available! The released debriefs are available on our free CalBar Updates platform. Sign up here to register for CalBar Updates. If you've already signed up for CalBar Updates and are trying to log back in, click here and navigate to "CalBar Updates" then "July 2018 Bar Exam." Question 5 and the PT now available! 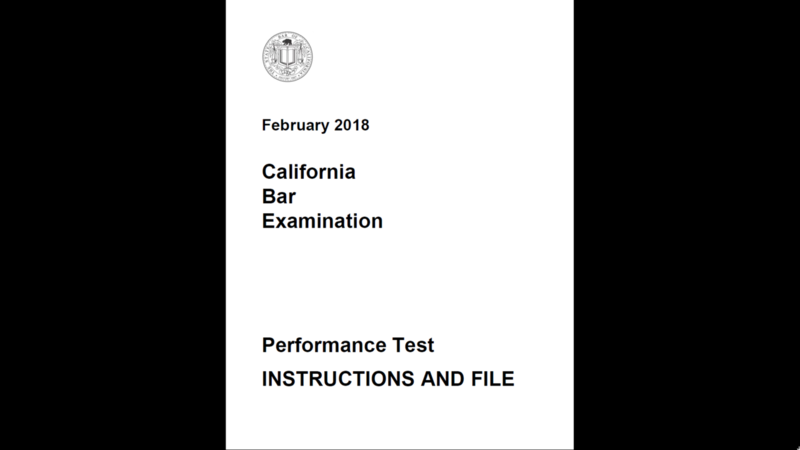 Our debriefs of the February 2018 California Bar Exam essays and PT are now complete, and we have already begun releasing them. The released debriefs are available on the CalBar Updates platform. Access to CalBar Updates is free. Sign up here to access them now. Our debriefs for the July 2017 California Bar Exam essays and PT are now complete, and we have already begun releasing them. The released debriefs are available on the CalBar Updates platform. Access to CalBar Updates is free. Sign up here to access them now.